Home » Article of the Week » Who Won Our Santa’s Favorite Wreath Christmas Giveaway? Hi Everyone! We hope everyone is enjoying participating in our exciting Christmas gift contests this holiday season! If you are wondering who the lucky winner if of our latest contest, the suspense is almost over! That’s right- it’s finally time to announce the winner of our Santa’s Favorite Wreath Christmas Giveaway. Before we do, though, we just want to send out a massive thank you to all of those who continue to participate in our great giveaways. We had a great time reading through all of your comments and finding out which gifts you love the most. As always, the winner of the latest gift giveaway was randomly selected by the owner and creator of ChristmasGifts.com- Susan. Are you ready to find out who the lucky winner of Santa’s Favorite Wreath by Christmas Forest is? We are so excited for you Athena! This beautiful wreath is going to look wonderful as part of your holiday decor this year. You can find out more about the Santa’s Favorite Wreath here. 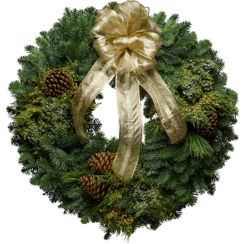 We can’t wait to hear about how much you love your new wreath, so please be sure to visit us again, click on the product, and give us some feedback about your experience with the wreath once you’ve had a chance to really check it out! Please Note: Athena will be notified right away and she will have a week to claim her beautiful new Christmas gift. If we don’t hear from her within that week, Susan will choose another winner to take her place. Don’t Give up! You Can Still Win With More Christmas Gift Contests Here at ChristmasGifts.com! If you haven’t been lucky enough to win something great with one of our Christmas gift contests yet, don’t become discouraged. We are always hosting new contest that feature fantastic gifts from our unique merchants. Be sure to keep checking our blog and follow us on social media like Facebook and Twitter to make sure you don’t miss an opportunity to win! Do you want to see more great contests at ChristmasGifts.com? Let us know your thoughts on making our Christmas gift contests even more fun and exciting in the comments section below! OMG, This is beautiful! I’m so excited, I can’t wait to hang this on my door! Thank you!